The legend of Spartacus has lived on for centuries, and now the Gladiator has been immortalised on the reels thanks to WMS and their Spartacus Gladiator of Rome slot machine. Believed to have been born in Thrace, Spartacus was a soldier in the Roman army before being sold into slavery and trained at gladiator school before making an escape and taking refuge in Mount Vesuvius where many others joined him. Spartacus led his army of men in defeating a series of Roman attacked before the administration in Rome took notice and set about defeating Spartacus and his army, and ultimately proving successful in their task. It’s a story that has spawned countless novels, films, and television shows but WMS have certainly done it justice on the slot reels. Of course, the experienced players amongst you will know that this is not the first slot released based on gladiators as WMS have also released the Roman Chariots slot machine and Playtech is home to the blockbuster Gladiator slot machine - but will the sword-wielding antics of Spartacus prove too strong for the competition? Enter the coliseum and prepare to battle in front of the baying crowd, with victory promising you lots of golden coins. Boasting the colossal reel’s feature that was also used in the KISS slot machine, this means that there are two different sets of reels on screen. The main reel set consists of a 5x4 grid while the colossal reel set consists of a 5x12 grid, with 100 adjustable paylines on offer. Don’t worry though you won’t need pockets as deep as the Roman Emperor as the staking options are rather generous, enabling you to spin the reels for as little as 50p up to a maximum of £250 each spin – and your money will last thanks to the friendly 95.94% return to player percentage stated. The symbols in Spartacus are incredible and will instantly get you into the gladiatorial spirit, with the most iconic one of all being the stacked Spartacus character symbol with him in his full battle gear holding a shield and clutching a razor sharp sword, plus there is also a stacked female Gladiator showing off her legs but wielding daggers with a menacing look in her eyes. The Wild symbol is the Spartacus Gladiator of Rome logo and this works as slots normally do, substituting for all symbols apart from the Scatter, but in addition to this trait it can appear stacked and cover the whole reel before transferring over to the Colossal reels for even more wins. The Scatter is also known as the feature symbol and this is represented by the iconic Coliseum where Gladiators went to battle in front of blood-thirsty crowds. In addition to this there is an armoured gladiator who we presume to be Spartacus’ opponent, a lion, gladiator helmet, sword, plus low valued playing card suit symbols including a pink diamond, purple club, red heart, plus a blue spade – a nice change from Ace to 10 symbols! 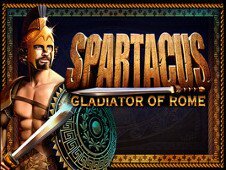 Like many WMS online slot machines, Spartacus Gladiator of Rome only contains a free spins mode rather than progressive jackpots, instant wins, and pick ‘em games, but thankfully it offers wins to make the battle scars worthwhile. As your free spins play out Spartacus will bring additional action to the reels appearing stacked on the main reels and making four positions Wild before switching over to the colossal reel set for a completely Wild reel which never fails to reward you handsomely. In addition to this you can actually retrigger additional free spins by landing more Scatters, and if you land a really big win you’ll find Gold and Silver coins splash across the screen with ‘Super Big Win’ displayed along with your total win which is always exciting. Wins Fit for a Gladiator! The Spartacus Gladiator of Rome slot machine is quite sensational, taking you back to a time when gladiators doing battle in the coliseum in front of blood-thirsty crowds was as normal as football matches nowadays. It can be played online with the biggest battle of all coming in the free spins mode where you can leave your mark with 20 free spins and wield your sword in victory!